Wintec are the designers and suppliers of aluminium for the Wintec Complete Aluminium Window & Door System - comprising all of the available window types, door types, fly screen options and security screen options. Streamline Windows utilises the Wintec Complete Aluminium Window & Door System. All products in the Wintec Window & Door System range come with a 7 year product warranty. 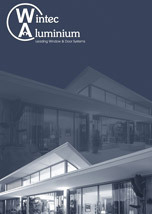 Download the Wintec product brochure. Download the Wintec product guide. Download the Wintec performance results.